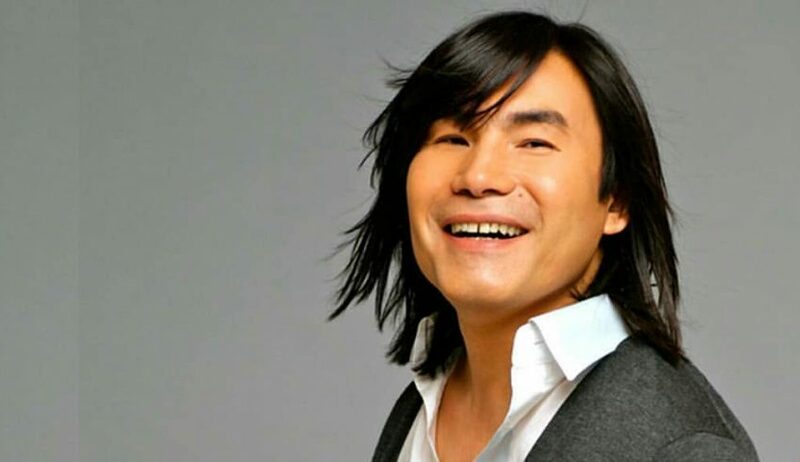 With talk of Kazakhstan potentially competing at Eurovision in the not-too-distant future after a debut appearance at the Junior version and awaiting word on a second attempt there, we go back to the Russian national selection of 2005 as Batyrkhan Shukenov, the former frontman and founder of famous Kazakh pop band A’Studio, tries to make the cut for Eurovision 2005 in Kyiv, Ukraine. 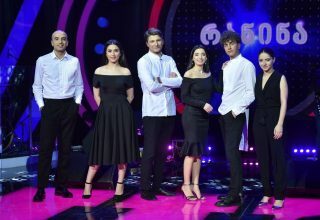 With Daneliya Tuleshova’s sixth place finish at the 2018 Junior Eurovision Song Contest, talk has inevitably led to when Kazakhstan will make its debut at the adult Eurovision. 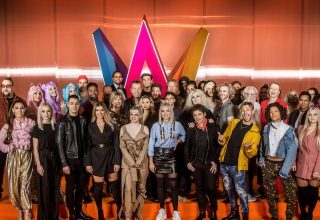 The European Broadcasting Union ruled out Kazakhstan’s participation at Eurovision 2019 in Tel Aviv, but admitted that talks were ongoing with the Khabar Agency, a major media outlet in Kazakhstan, about future projects including participation. But a performer from Kazakhstan has attempted to qualify for Eurovision before. And the Kazakh who attempted entry was the former frontman and saxophonist of one of the Soviet Union and Russia’s biggest pop bands: A’Studio. Born in Kyzlorda, in the then Kazakh Soviet Socialist Republic on May 18, 1962, Batyrkhan Shukenov studied jazz and performed in several bands in Alma-Ata (now Almaty) in the early ‘80s. He was then recruited by local band Arai, formed by pianist and keyboardist Baigali Serkebayev, and also joined by vocalist Najib Vildanov, guitarist Bulat Syzdykov, bassist Vladimir Mikloshich, and drummer Sagnay Abdulin. The band name morphed into Almaty in 1988, then Almaty Studio, before the summer of 1989 when the shortened name A’Studio stuck. The summer of 1989 was when it all came together for A’Studio. That summer, Shukenov and Serkebayev composed the music that was their signature blend of new wave pop, funk, jazz, and Kazakh folk, and the song “Julia.” It’s not every day you hear a saxophone solo on a bass heavy new wave song with jazz piano running throughout, and it got them noticed by none other than Philipp Kirkorov, who would pass on the recording to Alla Pugacheva. In the meantime, Shukenov was elevated to frontman as Vildanov left the group, and Baglan Sadvakasov replaced Syzdykov on guitar, cementing the classic A’Studio line-up. Upon hearing “Julia,” Pugacheva was blown away by its unique straddling of the modern and the folk, and invited the band to Moscow to participate in her annual “Christmas Meeting” on New Year’s Eve 1989. Launching “Julia” to the public on the dawn of 1990 sent A’Studio immediately into the upper echelon of Russian pop music, and they immediately set to work producing their next album “Julia,” including a reworked version of the title track with top tier production provided by Pugacheva. British recording company Polydor got wind of this curious Kazakh band lighting up the Soviet Union, and invited them to London to do a three track demo. Producer Greg Walsh produced the demo, and he would go to mix and produce most of A’Studio’s records in the 1990s, including “Unloved” (1996) and “Sinful Passion” (1998). World tours followed, including through Western Europe and the United States, and as the Soviet Union fell their music remained popular throughout the decade. 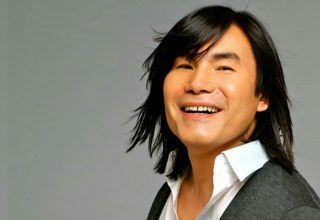 However, Shukenov left A’Studio in 2000 to pursue a solo career due to differences in opinion as to where to take A’Studio musically, with Shukenov favoring a return to a more jazz and folk style and Serkebaev wanting to evolve in a more modern style, similar to the evolution that their mentor Kirkorov had over the years. “For the group it was a blow,” Serkebaev said. “We were no longer invited to concerts. To be honest, the existence of A’Studio was questionable.” But the rest of A’Studio persisted, and Serkebaev hired Polina Griffith, a Russian singer he had met while she was waiting tables in New York City in 1994 and who maintained contact through the years as she worked as a singer in several electronic dance music bands. 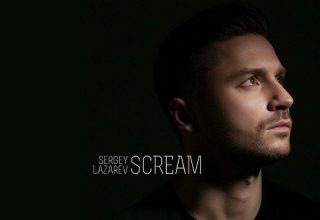 A’Studio reworked their sound to become more in sync with the modern dance music trends in Russian pop, and Shukenov began releasing his solo work, with six albums to date. As A’Studio looked westward and towards the modern, Shukenov looked eastward and towards the classical, producing and releasing several successful and popular ballads. 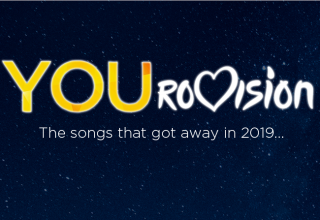 And when it was announced that Russia would have a national final as a qualifier for the Eurovision Song Contest in 2005, Shukenov pounced and entered his soft romantic ballad “Tvoi shagi” (Your Steps). In a curious aside, Shukenov’s replacement in A’Studio, Polina Griffith, left the band and began focusing on a solo career, and also entered the national finals, though she was in Semi-final 3. She also did not make it to the final, coming in 6th. The eventual winner, narrowly beating Dima Bilan in the final, was Natalia Podolskaya with her controversial “Nobody Hurt No One,” considered as such as it contained anti-war lyrics that specifically pointed to the United States. And for those who can recall, Eurovision 2005 was an odd one for a variety of reasons. 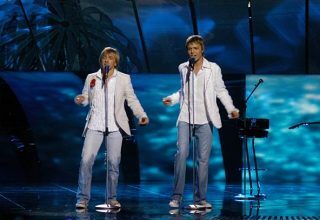 There were two rock entries in the top ten with Estonian symphonic rock group Vanilla Ninja competing for Switzerland with “Cool Vibes”, and Norway’s glam rock outfit Wig Wam with “In My Dreams.” The idea of the “The Big Four” (France, Germany, Spain, The United Kingdom) getting automatic qualification for the final took a hammering as they were also the bottom four that year (Germany’s last place performer Gracia, in particular, drawing much ire because her producer was caught trying to manipulate the German singles charts with mass single buyback tactics). The most notable controversies of that year were the familiar bete noire of Eurovision – breaches of the political content rule. Ukraine’s GreenJolly, who entered “Razom nas bahato” (Together we Are Many), a hip-hop song that was an anthem of sorts for Ukraine’s Orange Revolution of 2004, closely won Ukraine’s national final over Ani Lorak despite controversially failing two of Eurovision’s cardinal rules – its content openly referenced President Viktor Yushchenko, and it was technically already published. 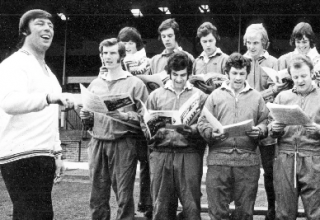 GreenJolly reworked the lyrics, and because the song was a riff on a Chilean protest song that was never officially released as a royalty-earning single, it skirted the original composition rule. Somehow. The suggestion of anti-American lyrics in “Nobody Hurt No One” seems subtle in comparison. But despite the shenanigans and technical issues that plagued many acts, one can argue that quality ultimately won through in the end. Helene Paparizou blended traditional Greek instrumentation with a modern (for the time) dance track and a memorable and well-choreographed routine with “My Number One” and was, well, number one. She narrowly beat the ballad “Angel” by Malta’s Chiara, and until Ell & Nikki in 2011, held the record for Eurovision winner with the lowest average jury vote score. Chiara’s close second is a reminder during national selection time that those “older” sounding adult contemporary acts can surge to victory or close enough if it’s a quality singer paired with a quality composition. Though “Tvoi shagi” is not Shukenov’s most memorable song, its Russian soft rock sensibilities would not have ruled it out as a contender in Kyiv. “Angel” showed that there was an opening for softer sounds on a rock night, and “My Number One” showed you can enter something particular to one country yet with universal appeal. “Tvoi shagi” is both and can’t possibly have fared worse than Podolskaya’s 15th place finish which, probably more to do with politics than performance, garnered a lot of booing on the night. Shukenov’s career continued, and his stock continued to rise in his native Kazakhstan and Central Asia. He was even recruited in 2009 as the UNICEF Goodwill Ambassador for Kazakhstan, a prestigious honor. A’Studio recruited the self-proclaimed “Princess hooligan from Tbilisi” Keti Topuria as their next singer, and continued their pop evolution. They recently celebrated the band’s 30th anniversary, and are still releasing charting singles and albums. Unfortunately, Shukenov died unexpectedly of a heart attack on April 28, 2015. That day, thousands of fans gathered outside the Arman cinema in Almaty and performed an impromptu concert. More fans gathered at his funeral days later at the Zhambyl State Philharmonic Hall in Almaty to send off a legend whose songs had provided joy to so many Kazakh and Russian nationals during a tumultuous time in their respective nation’s histories. Do #YOU think Russia should have sent “Tvoi shagi” to Kyiv instead of “Nobody Hurt No One”? Or would Shukenov’s adult contemporary style been eclipsed by the unmistakably Greek yet modern dance infused Helene Paparizou, or the similarly balladic Chiara? Share your thoughts with us on our forum, below in the comments or on social media!